When I was a little itty bitty thing, all of 2 years old, I had a big bad German Sheppard come after me. Fortunately there was a fence between me and that big old beast, but still, it scarred me for life! I was terrified of dogs for a long time. As I got older, I became more and more used to dogs and actually started to not mind them being around so much. But my house was not a dog house, they smell, they shed, you have to feed them and walk them and take so much care of them... not something my parents ever went for, even though they both had dogs growing up. We did end up with cats, my sister wanted one so badly and so we got one and the little brat got herself knocked up at 5 months old! We kept one of the babies and so I had two cats for a while. My sister became highly allergic to them, and the original cat became my favorite little lady. We had to put her down when she was around 13 years old. It was so sad, she was such a good cat. Ever since I first met B he's been talking about getting a dog. I knew someday we'd get one, but I had no idea that as soon as we moved in together, he'd be chomping at the bit. Actually, he started talking about it a week or two BEFORE we moved. I knew I was in trouble. I wasn't ready to get a dog. So much change going on, transitions, the holidays, money's tight... and quite frankly, I still wasn't sold enough on owning a dog in general. I fought him on it until I was broken down into tears. But not even my dramatics could stop him. He started doing research online to find out what kinds of dogs are good for apartment living. What dogs are quiet, low key, don't shed a whole lot, etc. His co-worker has a greyhound and recommended looking into adopting one from a rescue. Wouldn't you know, there's one about 40 minutes from our home. He went on their website and found one that he liked, showed me the link, yeah he was cute. Thanksgiving day he spent a good amount of the day telling our families about our many conversations about having a pet and trying to get them to convince me that it's a good idea. My mom, of all people, the "you're never getting a dog" lady, was the first to pipe up and say that I'd love the dog once I had it. Friday morning he had to go to a job site to do an evaluation. The job site just happened to be about 10 minutes away from the rescue so he decided he'd just stop by to take a look. He came home from the rescue with a cell phone picture of him and his already beloved pup. Well, how do you say no to that?!? I decided that I'd go the next morning to the rescue to meet this little guy and see how we got along. B gave me a check for the donation amount on my way out the door "just in case" they let me take him home with me. I was really hoping that I could put it off maybe even another week. The rest of Saturday was a little crazy, we had a house full of guests all afternoon and into the late hours of the night. Roddy did very well with all the commotion, but the stress caused some tummy troubles the next day. Yesterday we spent the day all three of us laying around the house together. He is such a sweet dog. He just kind of lays around on his blanket in the living room with us. As soon as one of us gets up to move around, he's right there by our side. He loves people and when B took him to the dog park yesterday he was more interested in getting some love from the other dog owners rather than playing with the other dogs. Although I suppose that's what happens when you're stuck in a room with at least 20 other dogs all day every day. So far he's a great dog and we love him very much. I never thought I'd see the day when I'd become a doggy mommy, but that day has most definitely arrived!! Congratulations on becoming a dog owner. Roddy is adorable. Congratulations on becoming a greyhound owner!!! I'm so excited for you and B, and Roddy is one lucky hound! You have such a fun adventure ahead of you as you see Roddy's personality unfold as he settles in. A few greyhound tips: If you're not crating, muzzle when you're not home for awhile, to make sure he doesn't anxiety chew while you're gone. For the upset tummies (greyhound digestion is as sensitive as ours - LOL), keep a good stock of canned pure pumpkin in the pantry. When poos get loose, just put a couple scoops on their dinner. Ours gets a spoonful every day because she loves it so. Coats - If you live somewhere with cold weather, your hound is going to need a couple of coats - we have a fleece jacket from Gini: http://www.greyhoundfashions.com/ for fall, and a very distinguished winter coat from Chilly Dogs: http://chillydogs.ca/. When it gets really cold, she wears the fleece under the winter coat. Salty paws - If they salt sidewalks where you live, and you walk a lot, Mushers Secret is the answer - just rub some of the balm into their feet and between their toes to prevent salt from cracking Roddy's sensitive paws. And if you have any questions, reach out! I want to see lots more photos of your handsome boy! Oh, what a sweet story! anyway the story made me smile. 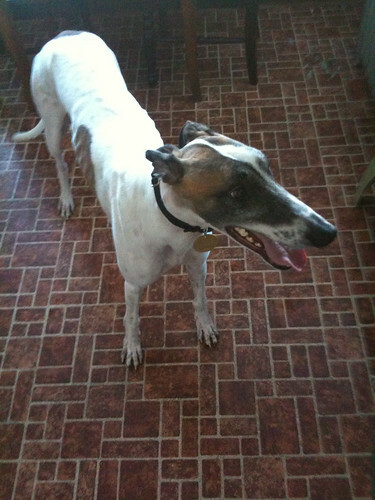 A greyhound is a really great dog--my family has had several retired racers. They are so sweet, and do like to just lay around! :-) You'll love him! Congratulations on your new addition to your family!!! My husbands' grandmother used to adopt retired Greyhounds and all of us fell in love with each one. That prompted us to look into rescue only we went for the big dogs. Great Danes! Dogs can bring such unexpected joy to our lives. They give more love than you'll know. I can't wait to see more pic's of him!